Methi bindi fry / masala is a quick side dish for roti, which is not only easy to make with less ingredients but also very healthy. I have used kasoori methi in this recipe, as i live in malaysia, where fresh methi leaves is not easily available. Normally i make bindi masala or aloo bindi, but wanted to try kasoori methi in bindi for a long time so tried it, and it became a instant hit. Here you go for the recipe.. When I was wondering what to make for evening snack on a rainy day, this cutlet flashed my mind and everyone at home loved it. 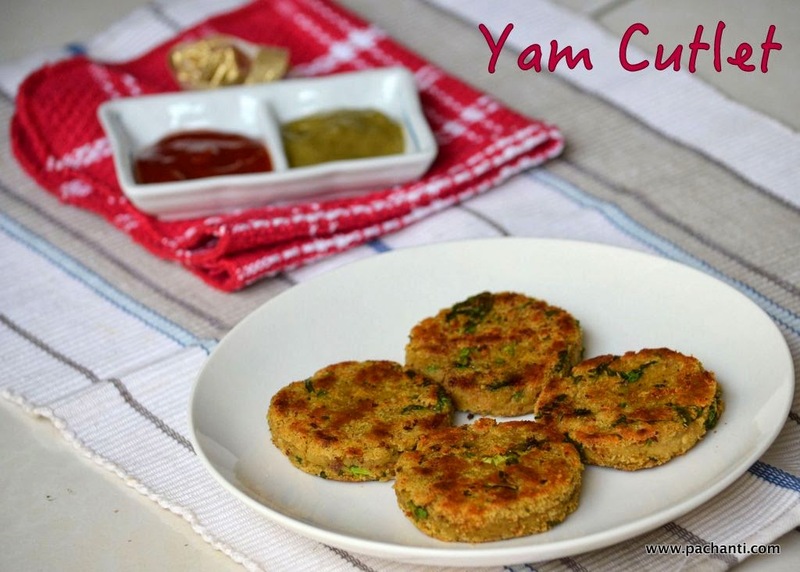 This Yam cutlet and adhrak chai ( Ginger tea ) is a excellent combo :-)))) I have used Elephant foot yam ( Senai Kizhangu in tamil or suran in hindi ) in this recipe. To make it healthy I have toasted in tawa instead of deep frying. More over there is no onion no garlic in this recipe. Just simple ingredients but tastes delicious. Karadaiyan Nonbu or SavitriNombu is a vow observed in Tamil Nadu on the last day in Maasi masam or the Masi month in Tamil calendar. This festival also marks the Meena Sankramanam or the transition of Sun into Meena Rasi (Pisces) from Kumbha rasi (Aquarius). During karadaiyan nombu women invoke the blessings of Gowri devi to attain such a husband for all seven births. Unmarried girls pray for a good husband and married women pray for their husband.s long life. During this festival married women and young girls used to fast and eat this uppu adai ( Savory ) and vella adai ( Sweet ) with butter. Prayers are offered to GowriDevi and women meditate on Savitiri and wear a yellow thread round their neck as they chant the following sloka. Neivadhayam is made of betel leaves a adai made out of rice and butter. On this occasion let me wish all the ladies a happy karadayan nonbu. 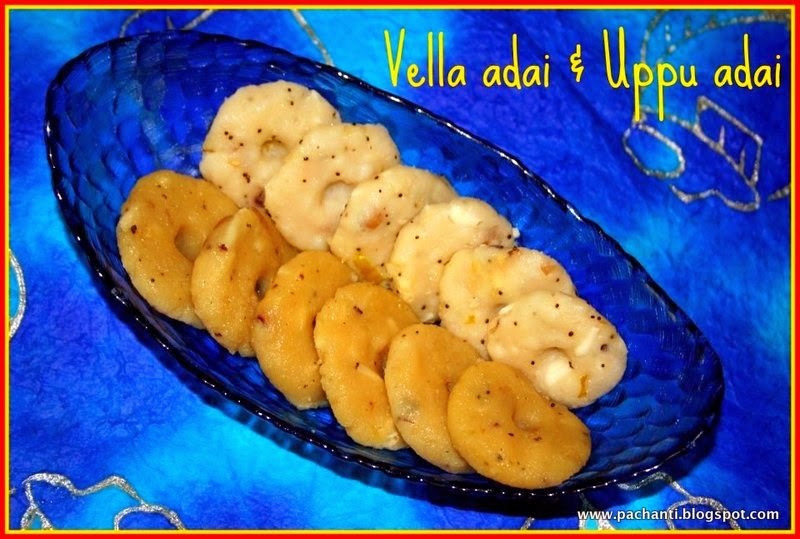 Following is the preparation of vella adai & uppu adai or simply nombu adai.. It is a very easy to make tiffen item which is ideal for breakfast or dinner.. I am a great lover of punjabi food. Love the rich taste and aroma of the punjabi food. Rajma/Kidney beans Masala/ Gravy is a nutritious food. Onions - 2 (Medium Sized ) Very Finely chopped. Tomato - 3 (Medium Sized) Either Pureed or Very Finely chopped. Salt - As per needed. Soak Rajma / Kidney beans for about 12 hours and pressure cook with enough water and salt until soft. Heat oil in a pan, add bay leaves now add very finely chopped or you can grate also. Saute for a minute with little salt, now add grated ginger garlic to it and sauté until the mixture turns golden brown in color. Now add tomatoes, turmeric, red chili powder, coriander powder, cumin powder and sauté until oil separates from the mixture. Now add cooked rajma (add water to adjust the thickness of the gravy) add garam masala bring it to a boil. Garmish with a teaspoon of desi ghee/Clarified butter and chopped coriander leaves. Serve with rice or Roti. This gravy tastes even more good the next day ;-) as it would have absorbed all the spices well. * When using Cumin/Jeera Powder and Coriander Powder in this recipe, try to dry roast separately and grind to a fine powder. It surely enhances the taste and aroma of the gravy/masala unlike the store bought ones. Rajma / Kidney beans are a very good source of cholesterol-lowering fiber, as are most other beans. In addition to lowering cholesterol, kidney beans' high fiber content prevents blood sugar levels from rising too rapidly after a meal, making these beans an especially good choice for individuals with diabetes, insulin resistance or hypoglycemia. Kidney beans are an excellent source of the trace mineral, molybdenum, an integral component of the enzyme sulfite oxidase, which is responsible for detoxifying sulfites. Just one cup of cooked kidney beans supplies 177.0% of the daily value for molybdenum.Kidney beans, like other beans, are rich in soluble and insoluble fiber. A cup of cooked kidney beans provides 45.3% of the recommended daly intake for fiber. My mom is an awesome cook. She used to make soft n crispy paruppu/dal vadai. Normally kadalai paruppu (Bengal gram) is only used for making paruppu vadai/aama vadai. But my mom use 4 different paruppu/dal, Which makes the vadai soft even after it cools down. Here is my mom's version of paruppu vadai. Ingredients : Makes 6 Vadai's. Hing/Perungayam(Asafoetida) - A Generous pinch. Soak Dal's / Paruppu together for 2 to 3 hours and drain it. Grind it coarsely along with ginger, red chilies, Salt. Mix Suji/Semolina, chopped coriander leaves, asafoetida, cold butter and curry leaves to the ground mixture. Heat oil in a deep pan, and take a small ball of mixture and flatten it in the palm and drop it in the hot oil (make sure oil is not fuming) and fry till both the sides turn golden brown, drop 3 or 4 vada's at a time, don't over crowd. Crispy and soft vadai's are ready to eat.